Imogen's Typewriter. : Blogmas Day 6: My Favourite Christmas Music! Tomorrow I'm going to drag out my vintage Samsonite suitcase and open it up to an explosion of Christmas decorations. But this isn't my decoration post, oh no, this is my Ultimate Christmas Music post that is going to be on repeat all day as I dance around like a idiot eating a Terry's Chocolate Orange and spreading Christmas cheer in the form of light up Polar Bears and Tartan Reindeers. I'm so excited for it. 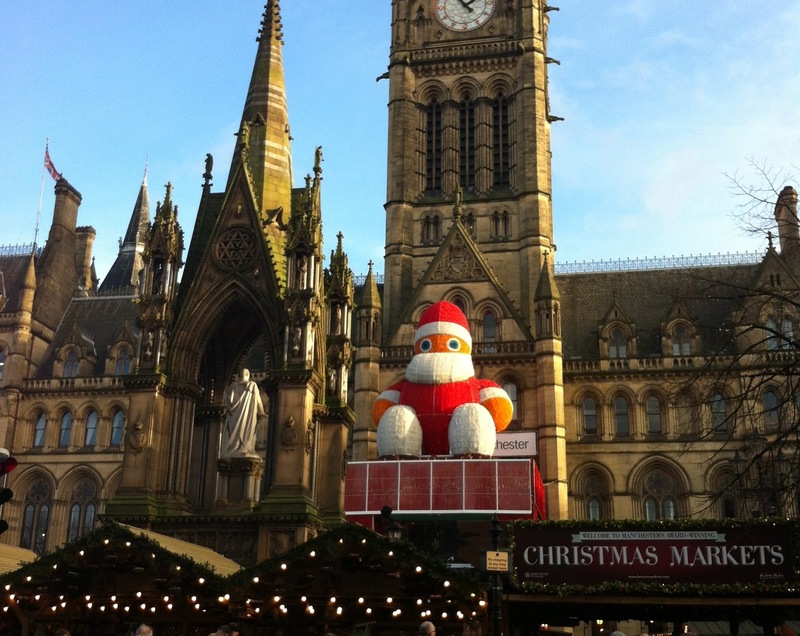 I couldn't find a relevant picture so have one of the massive Santa watching over the Manchester Christmas Markets. I'll be listening to an old family classic. The Rat Packs Christmas album and you can find the entire CD on YouTube here! Dean Martin, Sammy Davis Jr and Frank Sinatra. Could anything be more brilliant? My family has played this every year for as long as I can remember and I'm still not bored of it. The best song, at least in my opinion, is the Live version of Marshmallow World sang by Frank Sinatra and Dean Martin. They look like they're having so much fun together and you can watch the video from 1967 here! Also, you are doing yourself a disservice if you don't check out this playlist full of vintage Christmas music that I challenge you to listen to and not feel in the mood. This was when Christmas music was original and great, there's no auto-tune in sight, just honest to god brilliant singers. Perfect. And lastly, a new favourite of mine is Michael Bublé's Christmas album. Generally I prefer the classics but he's stolen my heart this year. Definitely worth a listen. And the whole thing is on YouTube if you want to check it out here! I hope this helps get you in the mood. I certainly feel more jolly!